Monday to Friday exlcluding Public holidays. By appointment only. Bhavini is a personable lawyer who was called to the Supreme Court of Singapore in 1995. Her primary expertise lies in her broad knowledge of both foreign and local law. Working with a large network of trusted associates around the world, she advises and facilitates profitable connections for corporations looking to invest or to operate businesses in Singapore and beyond. 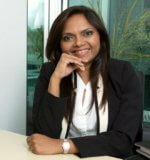 As a corporate lawyer, she assists SMEs in expanding their services and branding internationally. For individuals, Bhavini leverages on her global affiliations to provide wealth management, estate planning and asset protection enabling clients to attain economic and personal freedom . She believes in an open and collaborative style of practice that builds long-term relationships with her clients. Above donning her corporate suit , Bhavini advises non-governmental and non-profit organizations on a pro bono basis. Ms Shah is a responsive & helpful lawyer. She displayed her professionalism when explaining things I need to know for will writing. The fees are reasonable & affordable. Glad to have Ms Shah helping me out. Used Ms Bhavini Shah’s practice for advice on a SME takeover transaction. Coupled with sound legal advice, her relative promptness in drafting up the required documents through various rounds of negotiation made matters a lot easier for me. The professional fees was also reasonable, which suited the said transaction ideally. Would gladly recommend Ms Shah’s practice to others – she would be my first point of call for any other legal matters in the future in any case. Bhavini was a very approachable lawyer who did up a pre-nup agreement promptly and satisfactory. Making the simple will with Ms Bhavini was a breeze. We represent clients in the application for grant of probate, letters of administration & resealing of foreign grant at reasonable and affordable fees. We assist clients in obtaining an appointment of deputy court order under the mental Capacity Act to take charge of the personal welfare and/or property and financial affairs of their loved ones who are mentally incapable of making decisions for themselves. Our fees are very reasonable and affordable. We offer professional legal advisory & drafting of legal documents for individuals, corporations and SMEs.